Bayer Leverkusen super kid Joshua Chima Eze is poised to make his international debut for Germany when their U16 National Team trade tackles with Belgium in an international friendly next month. Germany U16 boss Christian Wück has included Eze in a 22-player roster announced for the friendly matches against Belgium on October 7 and 13. Born March 20, 2003, Eze was promoted to Bayer Leverkusen's U17 setup before the start of this season and made his debut in the B-Junioren Bundesliga West against Borussia Mönchengladbach last month. SC Freiburg goalkeeper Noah Atubolu and FC Liefering striker Karim-David Adeyemi had trained with Germany U16 team before they were promoted to the U17s this season. 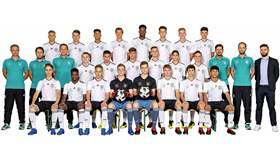 Eze's Bayer Leverkusen teammate Achunike Ekene, who remains eligible for Germany U16s and has two international caps to his name, has been omitted from the latest roster. Joshua Eze has been on the books of Bayer Leverkusen since 2010.